Received September 12, 2018; Revised October 6, 2018; Accepted October 8, 2018. Wheat is frequently exposed to high temperature during anthesis and ripening period, which resulted in yield loss and detrimental end-use-quality. The transcriptome analysis of wheat under high temperature stress during the early stage of the grain filling period was undertaken. Three expression patterns of differentially expressed genes (DEGs) during grain filling period were identified. The DEGs of seed storage protein and starch-branching enzyme showed continuous increases in their expressions during high temperature stress, as well as during the recovery period. The activities of the enzymes responsible for the elimination of antioxidants were significantly affected by exposure to high temperature stress. Only the WAS-2 family genes showed increased transcription levels under high temperature stress in dehulled spikelets. The relative transcription levels for sub-genome specific WAS-2 genes suggested that WAS-2 genes reacted with over-expression under high temperature stress and decreased back to normal expression during recovery. We propose the role of WAS-2 as a protective mechanism during the stage of grain development under high temperature in spikelets. Common wheat (Triticum aestivum L.) is one of the most important crop species for human consumption in the world, and has the largest growing area (http://faostat.fao.org/) of any crop species. Wheat is frequently exposed to high temperatures during its anthesis and grain development periods, which resulted in yield loss and unsuitable end-use quality. Heat stress can accelerate crop development, which can shorten the grain filling period, reduce starch deposition, and also reduce grain size (Farooq et al. 2011; Ferreira et al. 2011). Warmer temperature has a high impact on the grain filling stage; it can cause 80%-90% losses in overall production, compared to its effects on other growth stages (Hatfield and Prueger 2015). For every 1°C increase in temperature, there is a decrease of 6% in wheat yield, which becomes more irregular with time (Asseng et al. 2015). The anthesis stage is more sensitive to high temperature stress than other growth stages, and it can decrease the overall plant yield by up to 75% when it is exposed to temperature of 35°C or above during this stage (Khan et al. 2015). Elevated temperatures often cause grain weight loss and reduces the quality of wheat (Mullarkey and Jones 2000; Chen et al. 2002; Maestri et al. 2002). Heat stress disturbs cellular homeostasis, and can lead to severe retardation in growth and development, and even death. As sessile organisms, plants are constantly exposed to changes in temperature and other abiotic factors. Worldwide, extensive agricultural losses are attributed to heat, often in combination with drought or other stresses (Mittler 2006). Both abiotic and biotic stresses induce profound changes in plant proteomes aimed at adjusting metabolism to a change in their environment, and can enhance plant stress tolerance (Kosová et al. 2014). Cereal agricultural production is limited by a wide array of abiotic and biotic stress factors, including drought (Cattivelli et al. 2008), cold (Thomashow 1999; Kosová et al. 2008), salinity (Munns 2005; Kosová et al. 2018), imbalances in mineral nutrition, and viral and fungal pathogens. The central factor in both biotic and abiotic stresses, which occurs during imbalance in any cell compartment between the production of reactive oxygen species (ROS) and antioxidant defense systems, is oxidative stress, which leads to a varied degree of physiological challenges. ROS can be viewed as cellular indicators of stress and secondary messengers involved in all aspects of plant biology, from gene expression and translation to enzyme chemistry (Foyer and Noctor 2003). Drought, as an environment stressor, is considered necessary for coping with changes in the antioxidant enzyme activity in tissue (Lawlor and Cornic 2002). Water stress also leads to the formation of ROS, which are extremely harmful to plants (Zhu 2002). These studies suggested that to prevent or alleviate injuries from ROS, plants have evolved an antioxidant defense system that includes enzymes such as superoxide dismutase (SOD), catalase (CAT), peroxidase (POD), and ascorbate peroxidase (APX) (Gratão et al. 2005). The oxidative damage of biomolecules is a common trait, and can be used as a parameter for measuring abiotic stress severity. Pathogenesis-related proteins (PR-proteins) are induced by pathogen infections, and play important roles in plant defense systems (Stintzi et al. 1993; Van Loon et al. 1994). Accumulation of PR-proteins is induced by phytohormones, chemical inducers, and osmotic or salt stresses (Stintzi et al. 1993). It was also reported that several apoplast proteins that were accumulated in cold-acclimated winter rye seedlings possessed antifreeze activities (Griffith et al. 1992; Hon et al. 1994). Abscisic acid induces some PR proteins that are related to the defense system in wheat (Kuwabara et al. 1999). When wheat seedlings are grown under drought stress, PR proteins are also expressed (Liu et al. 2015). Pathogenesis-related CSEP0055 interacts with the barley pathogenesis-related protein PR17c and promotes fungal aggressiveness by suppressing defense (Zhang et al. 2012). Hence, the defensive role of PR proteins, not only in pathogenesis but also in other abiotic stresses, are recognized. PR17c precursor is a member of the basic secretory protein (BSP) family. BSPs are reported to be part of the plants defense mechanism against pathogens. The BSP family has a similar sequence and motif to one of the two zinc-dependent metallopeptidases; they contain the HEXXH motif, within which there are two zinc ligand histidines, and the active site is between its two sub-domains. Until now, 1102 sequences of 561 species are reported to belong to the BSP family (http://pfam.xfam.org/family/PF04450#tabview=tab7). Among them, 68 sequences were known to be from the Poaceae family, including T. aestivum (pfam.xfam.org/family/PF04450). We identified WAS-2 gene family members that are homologous to the barley PR17c precursor gene through DEG analysis of a heat-stressed wheat spike. The specific expressions of WAS-2 genes in relation to anti-oxidant enzyme activities during the grain develop stage were analyzed. We proposed that WAS-2s might be associated with the defense mechanism against high temperature during the early grain filling stage in wheat endosperms. The wheat cultivar ‘Baegjoong’ (KSVS, accession no. 3394), which is the most widely grown cultivar in south-eastern Korea, was used in this study. Seeds of ‘Baegjoong’, which were provided by the National Institute of Crop Science (NICS), Rural Development Administration (RDA) of Korea, were vernalized at 4°C under dark condition for six weeks. After vernalization, each seedling was transferred to a pot (top diameter, 10 cm; bottom diameter, 8 cm; height, 10 cm) filled with commercial soil, Sunshine® Mix #1 (Sungro, Agawam, USA). Wheat plants were grown in well controlled phytotrons (Gaooze Control System, Suwon, Korea) set at 16 hour day (21°C)/8 hour night (19.5°C), and an irradiance of 600 μmol/m2/s until the initiation of heat stress treatment (eight days after flowering). Temperature during the plant growth were measured every 10 minutes by HOBO data loggers (Onset Computer Corporation, Bourne, USA). Since each cultivar showed different heading dates and flowering times, individual plants were labeled with their flowering time in order to apply high temperature stress at the same growth stage for each plant. Once the main spike of each plant reached the same stage (DAF 8: eight days after flowering), plants that were subjected to high temperature stress were transferred to another phytotron where all ambient conditions are identical to those in the control phytotron, except for the higher temperature (34°C/31°C, day/night). The transferred plants were subjected to heat stress for five days (DAF 8-DAF 12). Pots in both the control and treatment phytotrons were randomly placed, and were rotated to minimize the positional effects. In order to reduce the edge effect, pots of the same growth stage wheat were surrounded. Three biological replicates were sampled for transcriptome, antioxidant enzyme activity, and qRT-PCR analyses. Both control and treated plants were sampled at eight days after flowering (DAF 8C; control; Zadok scale 69), day three of treatment (DAF10C, control; DAF10T, treated; Zadok scale 70), day five of treatment (DAF12C, control; DAF12T, treated; Zadok scale 71), and day three of recovery from the cease of last treatment (DAF15C, control; DAF15TR, treated-recovery; Zadok scale 72). Spikes from the three pots at each sampling time were pooled together, frozen immediately with liquid nitrogen, and stored at −80°C. Spikes from three individual plants at each sampling time were combined and used for RNA sequencing analysis. The total RNA was isolated using the TRIzol-based two-step method for DNA-free seed RNA extraction (Meng and Feldman 2010) and subjected to DNase I digestion and purification. RNA concentrations were measured using micro-volume spectrophotometer (Maestrogen, Hsinchu, Taiwan). Libraries were constructed for control and treated using the SENSE mRNA-Seq Library Prep Kit (Lexogen, Vienna, Ausria) according to the manufacturer’s instructions. Briefly, each 1.5 ug of total RNA was prepared and incubated with oligo-dT adhered to magnetic beads, and then other the RNAs except for mRNA were removed using a washing solution. High-throughput sequencing was performed as paired-end 100-bp sequencing using a HiSeq 2500 system. The wheat draft reference genome sequence (IWGSC1+ popseq.31) was directly downloaded from EnsemblPlants (http://plants.ensembl.org/Triticum_aestivum/Info/Index). To map the reads to the draft genome sequence, an index of the reference genome was constructed using hisat2 (https://ccb.jhu.edu/software/hisat2/index.html), and paired-end clean reads were aligned to the reference genome using hisat2, with all parameters set to their default values. HTSeq v0.6.1 (Anders et al. 2015) was used to count the reads that were mapped to each gene, and count how many reads were mapped to the exons of each gene. The mRNA-Seq reads were aligned to wheat reference sequences using Bowtie 2 (Version 2.3.3). Clean reads were aligned against assembled transcripts to generate read counts using the RSEM package. The read count of each uni-gene was converted into reads per kilo base per million mapped reads (RPKM) values to normalize the gene expression. For differential expression analyses in gene-based level, differential expression analysis between each treatment was performed using DESeq2 (Love et al. 2014) with a method for the differential analysis of count data. Genes with an adjusted absolute value of log2 fold change > |1|, according to DESeq2, were delineated as DEGs and annotated by blasting (BLASTx) against the NCBI non-redundant protein database for the Poaceae family and the protein sequence databases for rice, Arabidopsis, and Brachypodium (http://www.uniprot.org/), with an E-value cutoff of 10−3. DEGs were determined based on the number of unique and multiple alignments using EdgeR within R version 3.2.2 (Bolker and R Development Core Team 2014) using BIOCONDUCTOR version 3.0 (Gentleman et al. 2004). The global normalization method was used for comparison between samples. Gene classification was based on searches performed using DAVID (http://david.abcc.ncifcrf.gov/). Functions of uni-genes were annotated using a series of databases, including BLASTx searches against the NCBI non-redundant protein (Nr), NCBI nucleotide collection (Nt), and swiss-prot databases, with 10−3 as the E-value cutoff, and classified to the protein family (Pfam) database. Functional categories of putative uni-genes were grouped using Gene Ontology (GO, www.geneontology.org) analysis in Blast2GO to give the molecular function and biological process. PCR primers were designed using Primer3 (www.primer3.ut.ee), and the primer pairs used to amplify specific products were listed in Supplementary Table S1. Then, qRT-PCR was performed using the cDNA samples in a 10 uL mixture containing DNA master SYBR Green I. The PCR was performed as follows: initial denaturation for 10 minutes at 95°C, followed by 40 cycles of 15 seconds at 95°C, 1 minute at 57°C, 10 seconds at 72°C, and a final extension at 72°C for 5 minutes. Three biological replications and three technical replications, which make a total of nine qRT-PCR analyses for each stage. The result of the qRT-PCR from the dehulled spikelet (lemma and palea were removed) was compared to that of the spike. Total protein was isolated from the dehulled spikelet according to the method of (Goel and Sheoran 2003). Dehulled spikelets (100 mg) were frozen in liquid nitrogen and ground to a fine powder. The powder was mixed with 1 mL of 0.1 mol/L phosphate grinding buffer [pH 7.8, 10 mmol/L KCL, 1 mmol/L MgCl2, 1 mmol/L EDTA, 10 mmol/L 2-sulfanylethan-1-ol, and 0.2 g polyvinyl pyrollidone (PVP)]. The homogenate was then incubated and centrifuged at 14,000 × g, and the supernatant was collected and filtered before use. The APX activity was measured following the procedure (Nakano and Asada 1981), with some modifications (Kim et al. 2015). The reaction solution was mixed with potassium phosphate buffer (pH 7.0) containing 50 mM HEPES, 0.1 mM EDTA, 1 mM hydrogen peroxide, and 0.6 mM ascorbate. The enzyme activity was determined from the initial rate of the reaction using the extinction coefficient of ascorbate, and the absorbance was monitored at 290 nm using a UV spectrophotometer for 90 seconds. The CAT activity was determined by measuring the rate of consumption of hydrogen peroxide, using the method described by (Aebi 1983), with some modifications (Kim et al. 2015). The assay sample (1 mL) contained 50 mM potassium phosphate buffer (pH 7.0), 15 mM hydrogen peroxide, and 10 uL of protein extract. The addition of hydrogen peroxide initiated the reaction. The consumption of hydrogen peroxide was determined at 240 nm for 60 seconds using a UV spectrophotometer. The POD activity was measured using the method of (Kwak et al. 1995), which used pyrogallol as a substrate. The reaction mixture contained 100 mM potassium phosphate buffer (pH 6.0), 0.147 M hydrogen peroxide, 5% pyrogallol, and 30 uL of enzyme extract. The POD activity was measured by monitoring changes in the absorbance at 420 nm for 20 seconds, which was caused by the oxidation of pyrogallol. The SOD activity was measured by monitoring the inhibition of the photochemical reduction of nitro blue tetrazolium (NBT) (Giannopolitis and Ries 1977). The reaction mixture (1 mL) consisted of 50 mM potassium phosphate buffer (pH 7.8), 0.1 mM EDTA, 13 mM methionine, 75 uM NBT, 10 uM riboflavin, and 60 uL enzyme extract. The reaction mixture was placed under strong light conditions for 30 minutes. The SOD activity was measured at a wavelength of 560 nm using a UV spectrophotometer. The transcription levels in spikes from control and high temperature-treated plants were analyzed using the HiSeq 2500 system. The transcripts were obtained at four growth stages (Zadok scale 69–72) from control and high temperature stressed plants, and were mapped onto the reference sequence (wheat genome assembly TGACv1). 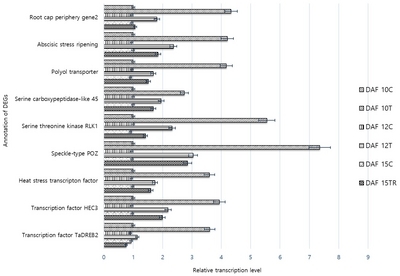 In total, 114,430 annotated genes were mapped in this study. These genes were chosen for their differential expression analysis. In total, 3882 DEGs with three-fold change (log2-fold) were obtained as a cut-off between the control and treated plants. After the removal of genes whose expressions were gradually increased, and those with no significant differences between the control and treated plants by time lapse during grain development, 580 DEGs were selected as heat-stress responsive genes. Further selection was performed, and in total, 46 DEGs that showed significant levels of up-regulation and down-regulation during the treatment (DAF8C-DAF12T) and recovery (DAF12T-DAF15TR) periods, and a pattern was obtained (Fig. 1, Table 1). Among the 46 DEGs, the major molecular function ontologies mapped onto this stage were nutrient reservoir activity (12%), ion binding [37% (iron, metal and DNA)], transport [3% (transmembrane transporter activity)], catalytic activity [30% (oxidoreductase, enzyme, kinase, nuclease, and endopeptidase)], and antioxidant activity [7% (oxido-reductase and peroxidase)] (Fig. 2A). Transcripts were involved in numerous biological processes, such as metabolic [15% (lipid biosynthesis, glycogen biosynthesis, transcription, and IMP salvage)], cellular [6% (asymmetric cell division)], transport [7% (metal ion transport)], catabolic [7% (xylan catabolism)], and stress response [35% (response to wounding, stress, heat, fungus, and oxidative stress)] (Fig. 2B). The removal of presumed similar DEGs that shared identical gene annotations resulted in 21 remaining DEGs. We ran qRT-PCR with each gene specific primer pairs of these 21 DEGs in the dehulled spikelet. The magnitudes of transcription of the DEGs were significantly different (Figs. 3–5). Nine out of the 21 DEGs, comprising transcription factors (TaDREB2, HEC3, HTF, and POZ), kinase (RLK1, and carboxypeptidase), transport (polyol), and response to stress (ASR, root cap periphery), were involved in the highest expression level at day three of heat treatment (DAF10T), and decreased with the extension of high temperature stress (DAF12T) and into the recovery period (DAF15TR) (Fig. 3). Eight DEGs, such as inhibitor (WSCI, serpin, and xylanase), antioxidant (peroxidase, C-4 methylsterol), and stress response (chopper chaperon and PR17c) proteins, showed a continuously increasing expression level during heat stress (DAF12T), which decreased during the recovery period (DAF15TR) (Fig. 4). Four DEGs that consisted of seed storage proteins (starch branching enzyme, avenin-1, low-molecular-weight glutenin, and alpha/beta-gliadin) showed continuous increasing expressions during heat stress as well as during the recovery time (Fig. 5). Plants produce a variety of antioxidant enzymes, such as APX, SOD, POD, and CAT, which protect and prevent plants from damage caused by environmental stress. Enzyme activities of APX, SOD, POD, and CAT during the early stage of the grain filling period under high temperature stress in relation to control were analyzed (Fig. 6). The enzyme assay shows that their activities were increased until the end of the stress treatment (DAF 12), and their expression levels were decreased during the recovery period in the optimum growth environment. WAS-2 (secretory protein, Gene ID: 542830) showed a higher transcriptional level during grain development under heat stress than the control in qRT-PCR (Fig. 4). WAS-2 was reported as endosperm specific during grain development (EnsemblPlants.plants.ensembl.org) and was annotated as 96% similarity with the barley PR17c precursor gene (NCBI GenBank accession no. EU131174.1). In order to obtain the full sequence of the WAS-2 gene, gene-specific primer sets were designed from the contig sequences downloaded from the PlantEnsemble and NCBI databases (accession no. AF079526). The cDNA sequence of WAS-2 comprises a 684 bp open reading frame, which encodes 226 amino acids (Supplementary Fig. S1). The WAS-2 gene is located on the 1AL sub-genome in T. aestivum. Additionally, two gene sequences to similar 684 bp 1AL cDNA, which reside on its homeologous chromosomes, were identified in 1BL and 1DL with 98% and 97% similarities (we named these 2 sequences as WAS-2-1BL and WAS-2-1DL), respectively (blast.ncbi.nlm.nih.gov) (Supplementary Fig. S1). The WAS-2 gene belongs to the BSP family. Little is known about the functions of the BSP family in wheat, and one of the important defense mechanisms is high tolerance to pathogenesis (Kuwabara et al. 1999). The gene name and coding sequence of each BSP family member gene was identified from EnsemblPlants (http://plants.ensembl.org). The BSP family member genes in T. aestivum were searched for with proteome analysis (http://pfam.xfam.org). The functions of eight out of the 15 genes that were found in T. aestivum have been previously studied (Supplementary Table S2). BSP family protein sequences of 15 genes were subjected to multiple alignments using Clustal Omega (www.ebi.ac.uk/Tools/msa/clustalo). Conserved motif searches were conducted on amino acid sequence alignments using the multiple EM for motif elicitation (MEME, http://meme-suite.org) tool from the MEME suite with default parameters. Fifteen genes were divided into six phylogenic clades, which were further confirmed by the following sequence analyses and motif structures (Fig. 7). Ten conserved motifs were detected in BSP proteins. All clades, except clade 5, which had a large phylogenic distance with others, showed similar amino acid sequences and motifs (Supplementary Fig. S2). Considering the broad data set of sequences in different plant species and insights into the evolutionary relationship of BSP families, a phylogenetic tree of BSPs was made based on protein homologs from a combination of seven species from the Poaceae family. Based on the BLAST search, we identified 51 BSPs in seven analyzed species. To investigate the genetic relationship of BSP genes in plant species, BSP members in key plants were also identified. The BSP orthologous genes were derived from Poaceae family (Triticum urartu, Oryza sativa, Zea mays, Brachypodium distachyon, Sorgium bicolor, and Setaria italica) full length cDNAs and amino acid sequences by Pfam. All orthologous group assemblies were created by clustering 55 genes by sequence similarity to orthologous grass gene sequences. The phylogenetic relationships among the identified BSP genes in the Poaceae family, along with T. aestivum, were analyzed by ITOL (http://itol.embl.de). The numbers of genes ranged from a minimum of three in B. distachion to a maximum of nine in O. sativa (Table 2). All identified BSPs were subjected to detailed phylogenetic analysis. The full-length proteins were aligned using ClustalW, and resulting alignments were used to the produce phylogenetic tree with iTol. The final tree was comprised of six classes, termed Classes 1–6 (Fig. 8). Until now, Pr17c precursor (pathogen-relative gene) showed defense activity toward pathogenesis. Further, in our RNA sequencing analysis, the WAS-2 gene family [WAS-2, WAS-2-1BL, WAS-2-1DL] was characterized as specific expressions, such as an increased expression level at high temperatures and decreased expression level at three days of recovery from the cease of five days of high temperature treatment during the early stage of grain development. BSP family genes were not expressed during the high temperature treatment, except for genes belonging to class 2 (WAS-2, WAS-2-1BL, and WAS-2-1DL) (Fig. 9A). Significant differences in the relative expression level of WAS-2, WAS-2-1BL, and WAS-2-1DL genes between treated and non-treated plants were identified (Fig. 9B). To explore the possible roles of the WAS-2 family, sub-genome (1AL, 1BL, and 1DL) specific primers [WAS-2-F (5′-GTCCTGGTGGCCTTGGCCGCGG-3′) and WAS-2-R (5′-TCGGCGACCGCAAGACTGT-3′), WAS-2-1BL-F (5′-GCGGTTTGAGCAGGCCG-3′) and WAS-2-1BL-R (5′-CTGTGGATGCCGTCACCCTC-3′), and WAS-2-1DL-F (5′-CGTACTCCAAGAAGGTCCTCTC-3′) and WAS-2-1DL-R (5′-CAGTACGTTGGCGGCATCTC-3′)] were designed, and qRT-PCR was conducted using a dehulled spikelet under high temperature stress (Fig. 10). The relative transcription levels of sub-genome specific genes were increasingly up-regulated as the treatment duration increased (DAF10T and DAF12T), and decreased during the recovery time (15TR). This result suggested that the WAS-2 gene family reacted with over-expression under heat stress, and decreased back to normal expression during recovery during the early grain filling period in the dehulled spikelet. Heat stress is known to adversely affect grain yield in wheat (Stone and Nicolas 1994). Temperature impacts yield and quality by altering the duration and rate of grain filling. Several studies demonstrated that drought decreased kernel size by shortening the duration, but not the rate, of grain filling (Brooks et al. 1982; Nicolas et al. 1984; Altenbach et al. 2003). The integration of genomic studies with developmental studies should make it possible to resolve complex patterns of gene expression during grain development, pinpoint key regulatory processes that are influenced by the environment, and reveal the molecular basis for environmental impacts on seed quality (Hurkman et al. 2003). Despite the significant deleterious effect of high temperature stress on wheat production, it is not clearly elucidated about the plant resistance mechanism to high temperature stress during the grain filling period. Therefore, it is significantly important for plant breeders to elucidate plant tolerance mechanisms in response to high temperature stress during the grain filling period. Gene expression analysis during grain development is significantly important for understand endosperm response under abiotic stresses. In this study, the results of qRT-PCR during the high temperature stress and recovery stages in the dehulled spikelet were different from those of RNA sequencing from the whole spike. The analysis of differentially expressed genes facilitated the discovery of genes associated with the response to heat stress. GsSRKm, a G-type lectin S-receptor-like serine/threonine protein kinase, is a positive enzyme regulator of plant tolerance under salt stress (Sun et al. 2013). The Polyol transporter, a member of the SLC2 family, activates the polyol pathway under oxidative stress (Uldry and Thorens 2004). The RING-H2 finger gene is involved in the regulation of growth and defense responses against abiotic and biotic stresses (Liu et al. 2008). The highest expression was observed at three days of stress, which decreased with further extension of high temperature stress as well as under normal conditions; this indicated that these genes might be associate with signal recognition and the regulation of the early resistance mechanism of the plant (Fig. 3). The major wheat storage proteins, the glutenins and gliadins, comprise more than 80% endosperm protein (Kolmer et al. 2008), and genetic subunit composition determines the end-use quality (Shewry 2009). Avenin is a protein in oats that is similar to wheat albumin and globulin (DuPont et al. 2006). The synthesis of macro-fractions (of albumin, globulin, gliadin, and glutenin) during kernel development was studied by several scientists (Kapoor and Heiner 1982; Slominski and Campbell 1990; Wright and Anderson 2000). Stone and Nicolas (Stone and Nicolas 1995) also reported that monomers other than albumins and globulins were synthesized in the early stage of grain development. This confirms the views that gluten-forming polypeptides, although in low concentrations, are synthesized even in this early stage of kernel development, and are accumulated in the later stages of development (DAF 10-DAF 53) (Abonyi et al. 2007). Starch branching enzyme I (SBEI) modifies starch structure and causes an altered starch granule morphology (Bhattacharyya et al. 1990; Craig et al. 1998). SBEI generally elevates levels of free sucrose and amino acids (Shewry and Kreis 1987). Starch granule synthesis is initiated during endosperm cell enlargement by SBEI, which starts at about 14 days post anthesis, and lasts until the wheat grain is mature (Briarty et al. 1979; Parker 1985). In our results, three seed storage protein genes (avenin-like b1, low-molecular-weight glutenin, alpha/beta-gliadin), and starch biosynthesis gene (starch branching enzyme I) showed increased transcription not only under high temperatures but also continued to increase during the recovery period. Therefore, those genes are thought to be expressed independently of ambient stress and dependent of the developmental growth stages (Fig. 5). The up-regulated transcription of protease inhibitors (trypsin inhibitor and subtilisin-chymotrypsin inhibitor) during high temperature stress was observed. These genes have been reported as inducible by stresses such as high aluminium, fungal infection, and wounding (Cordero et al. 1994). WSCI wheat subtilisin/chymotrypsin inhibitor seems to play a role of natural defense against attacks from pests and pathogens, making it possible to plan specific amino acid substitutions (i.e., by site-directed mutagenesis) to alter the protein function as required (Tedeschi et al. 2012). Sterols, such as C-4 methylsterol oxidase, are crucial components of eukaryotic membranes, and control membrane fluidity and permeability. They play an important role in cell signaling, polarity, and sorting. Since many steps in the pathway are essential, sterol biosynthesis inhibitors are widely used as antifungal agents (Madoui et al. 2009). Therefore, elevated transcription levels during high temperature stress periods and a decrease to normal level during recovery periods indicates selective proteases that might be associated with defense mechanisms (Fig. 4). The selective DEG group that gave the highest expression at the end of five days of heat stress thought to be responsible for defense mechanisms in response to high temperature stress. Therefore, those candidate transcripts that include antioxidants, inhibitors, and PR proteins are also responsible for defense mechanisms under heat stress during the early stage of the grain filling period. Plants have evolved both enzymatic and non-enzymatic anti-oxidant response systems against ROS injury (Vranova et al. 2002). Under heat stress, the expression of heat-shock transcription factor and activity of APX were studied because of their relationship (Panchuk et al. 2005). Transcripts of heat shock protein protected against heat stress involves changes in cell membrane stability and antioxidant enzymes (Sampath Kumar et al. 2012). Elucidating the response mechanism of wheat to high temperatures would help the development of wheat cultivars that perform better under high temperature stress. However, there is a limited amount of information about the effects of high temperature on wheat. As parameters, antioxidant enzyme activities in wheat should be good indicators for either plant’s tolerance or susceptibility to heat. These results indicated that the activities of enzymes responsible for the elimination of oxidants were significantly affected by exposure to heat stress (Fig. 6). Since plants are continuously challenged by a variety of biotic and abiotic stresses, they have evolved stress tolerance strategies to minimize damages (Lee and Luan 2012). The BSP family plays important roles in plant stress tolerance. 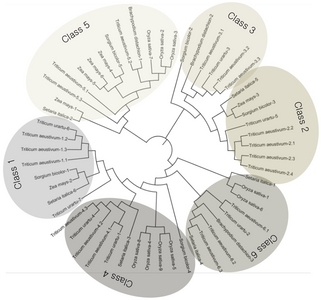 Further phylogenetic analyses based on the protein sequences of BSP families in Poaceae classified BSP genes into six classes (Fig. 8). While 69 sequences of Poaceae were retained in the Chlorophyta genome, a larger amount of BSP proteins were identified in land plant species. In general, whole genome duplications and segmental duplications are the major force for the expansion of genes. Further motif analyses showed high similarities between each protein in T. aestivum, suggesting a recent genome duplication event resulting in the expansion of the BSP family (Fig. 7). Recently, more and more reports have revealed that BSP family proteins play important roles in various stress response processes, as well being involved in plant developmental processes. However, each member of the BSP family was regulated in a specific tissue and during a specific period. Although they have similar sequence relationships, this does not indicate that they all have the same role. In previous studies, mature grain-specific genes (958.5 FPKM, 233.4 FPKM) that showed sequence homology only in the WAS-2 family from BSP genes were reported (Choulet et al. 2014). They are also endosperm specific (Pearce et al. 2015), and are not expressed in drought- and heat-stressed seedlings (Liu et al. 2015). In the present study, the results of the transcriptome analysis showed that the expression of WAS-2 family genes (WAS-2, WAS-2-1BL, WAS-2-1DL) are dehulled spikelet (presumably endosperm) specific in response to high temperature stress. Other BSP family genes, except for WAS-2 family genes, were not expressed during heat stress (Fig. 9). Therefore, the WAS-2 family genes might have a crucial role as a protective mechanism during the early stage (8–12 days from anthesis) of the grain filling period under high temperatures in the spikelet, and could be one of the main reasons why seeds are produced under adverse conditions. The transcriptome analysis of wheat under high temperature stress during the early stage of the grain filling period was undertaken. Three expression patterns of DEGs during DAF 10, 12, and 15 under heat stress were identified. 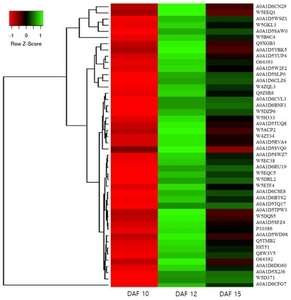 Among them, four DEGs of seed storage proteins genes and starch branching enzyme I gene showed continuous increases in their expressions during heat stress as well as in the recovery time, which indicated that these genes are independent of ambient stress and dependent of the developmental growth stages. The BSP gene family in relation to plant defense against pathogenesis has been widely studied. Here, we revealed that WAS-2 family genes are important responsive genes under heat stress in the dehulled spikelets of wheat during the early stage of its grain filling period. This work was carried out with the support of the “R&D Agenda Agriculture & Technology Development Program (Project No. PJ0122732018)” of the Rural Development Administration, Republic of Korea. Fig. 1. Heat map of 46 genes identified as differentially expressed during high temperature stress treatment. Fig. 2. Molecular functions (A) and biological processes (B) of 46 DEGs. Fig. 3. 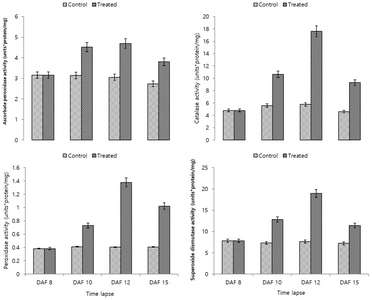 Relative transcription of a selective differentially expressed gene (DEG) group that showed the highest expression level at DAF10T and significantly decreased transcription levels at three days after (DAF15TR) the last treatment. DEGs belonging to this group are transcription factors, kinase, transport, and stress response genes. Fig. 4. Relative transcription of a selective DEG group that showed continuously increasing expression levels during high temperature stress and the highest expression level at DAF12T, and significantly decreased transcription levels at three days after (DAF15TR) the last treatment. DEGs belonging to this group are inhibitor (WSCI, serpin, xylanase), antioxidant (peroxidase, C-4 methylsterol), and stress response (chopper chaperon, PR17c) genes. Fig. 5. Relative transcription of a selective DEG group that showed continuously increasing expression levels during high temperature stress and during the recovery stage. DEGs belonging to this group are seed-storage-protein (avenin-1, LMWG, alpha-beta-gliadin) genes. Fig. 6. Enzyme activities of ascorbate peroxidase (APX), catalase (CAT), peroxidase (POD), and superoxide dismutase (SOD) during the early stage of the grain filling period under high temperature stress. Fig. 7. Phylogenic tree and motifs of BSP families in T. aestivum. Fifteen BSP protein homologs were identified in the proteome database of wheat. An unrooted phylogenetic tree was constructed based on multiple sequence alignment of the 15 protein homologs. Nine conserved motifs across all BSP families were identified through the multiple EM for motif elicitation (MEME) method. The schematic representation shows conserved motifs, and similar motifs are represented by the same box types. Scale bar indicates the number of amino acids (aa). Fig. 8. Phylogenetic tree of BSP genes in the Poaceae plant family. Based on the 51 identified homologs in seven plant species, an unrooted phylogenetic tree was calculated using ClustalW and iTol. The region is associated with six groups of proteins, i.e., Classes 1–6. Fig. 9. 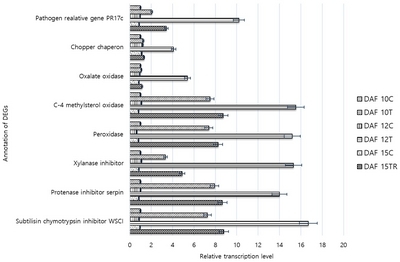 The expression of 15 wheat BSP genes (A) and relative transcriptional ratio (treated/control) profiles of three WAS-2 genes in response to high temperature stress (B) in the spike of T. aestivum. RNA sequencing was performed with three biological replicates, and the average is shown. Fig. 10. Sub-genome specific WAS-2 family gene (WAS-2, WAS-2-1BL, and WAS-2-1DL) expression patterns in grains under high temperature stress in relation to control and treated plants. List of 46 DEGs that are significant up-regulated during the treatment (DAF8C-DAF12T) and down-regulated during the recover time (DAF12T-DAF15TR). Basic secretory protein (BSP) members in selected plant species from the Poaceae family. In total, 51 sequences of seven species were analyzed in this study. Abonyi, T, Király, I, Tömösközi, S, Baticz, O, Guóth, A, and Gergely, S (2007). Synthesis of gluten-forming polypeptides. 1. Biosynthesis of gliadins and glutenin subunits. J Agric Food Chem. 55, 3655-3660. Aebi, H (1984). Catalase in vitro. Methods Enzymol. 105, 121-126. Altenbach, SB, DuPont, FM, Kothari, KM, Chan, R, Johnson, EL, and Lieu, D (2003). Temperature, water and fertilizer influence the timing of key events during grain development in a US spring wheat. J Cereal Sci. 37, 9-20. Anders, S, Pyl, PT, and Huber, W (2015). HTSeq-a Python frame-work to work with high-throughput sequencing data. Bioinformatics. 31, 166-169. Asseng, S, Ewert, F, Martre, P, Rötter, RP, Lobell, DB, and Cammarano, D (2015). Rising temperatures reduce global wheat production. Nat Clim Chang. 5, 143-147. Bhattacharyya, MK, Smith, AM, Ellis, TH, Hedley, C, and Martin, C (1990). The wrinkled-seed character of pea described by Mendel is caused by a transposon-like insertion in a gene encoding starch-branching enzyme. Cell. 60, 115-122. Briarty, LG, Hughes, CE, and Evers, AD (1979). The developing endosperm of wheat—a stereological analysis. Ann Bot. 44, 641-658. Brooks, A, Jenner, CF, and Aspinall, D (1982). Effects of water deficit on endosperm starch granules and on grain physiology of wheat and barley. Aust J Plant Physiol. 9, 423-436. Cattivelli, L, Rizza, F, Badeck, FW, Mazzucotelli, E, Mastrangelo, AM, and Francia, E (2008). Drought tolerance improvement in crop plants: an integrated view from breeding to genomics. Field Crops Res. 105, 1-14. Chen, X, Moore, M, Milus, EA, Long, DL, Line, RF, and Marshall, D (2002). Wheat stripe rust epidemics and races of Puccinia striiformis f. sp. tritici in the United States in 2000. Plant Dis. 86, 39-46. Choulet, F, Alberti, A, Theil, S, Glover, N, Barbe, V, and Daron, J (2014). Structural and functional partitioning of bread wheat chromosome 3B. Science. 345, 1249721. Cordero, MJ, Raventós, D, and San Segundo, B (1994). Expression of a maize proteinase inhibitor gene is induced in response to wounding and fungal infection: systemic wound-response of a monocot gene. Plant J. 6, 141-150. Craig, J, Lloyd, JR, Tomlinson, K, Barber, L, Edwards, A, and Wang, TL (1998). Mutations in the gene encoding starch synthase II profoundly alter amylopectin structure in pea embryos. Plant Cell. 10, 413-426. DuPont, FM, Hurkman, WJ, Vensel, WH, Chan, R, Lopez, R, and Tanaka, CK (2006). Differential accumulation of sulfur-rich and sulfur-poor wheat flour proteins is affected by temperature and mineral nutrition during grain development. J Cereal Sci. 44, 101-112. Farooq, M, Bramley, H, Palta, JA, and Siddique, KHM (2011). Heat stress in wheat during reproductive and grain-filling phases. CRC Crit Rev Plant Sci. 30, 491-507. Ferreira, RE, Chang, YK, and Steel, CJ (2011). Influence of wheat bran addition and of thermoplastic extrusion process parameters on physical properties of corn-based expanded extruded snacks. Brazilian Journal of Food & Nutrition/Alimentos e Nutrição. 22, 507-520. Foyer, CH, and Noctor, G (2003). Redox sensing and signalling associated with reactive oxygen in chloroplasts, peroxisomes and mitochondria. Physiol Plant. 119, 355-364. Gentleman, RC, Carey, VJ, Bates, DM, Bolstad, B, Dettling, M, and Dudoit, S (2004). Bioconductor: open software development for computational biology and bioinformatics. Genome Biol. 5, R80. Giannopolitis, CN, and Ries, SK (1977). Superoxide dismutase: I. Occurrence in higher plants. Plant Physiol. 59, 309-314. Goel, A, Goel, AK, and Sheoran, IS (2003). Changes in oxidative stress exzymes during artificial agening in cotton (Gossypium hirsutum L.) seeds. J Plant Physiol. 160, 1093-1100. Gratão, PL, Polle, A, Lea, PJ, and Azevedo, RA (2005). Making the life of heavy metal-stressed plants a little easier. Funct Plant Biol. 32, 481-494. Griffith, M, Ala, P, Yang, DS, Hon, WC, and Moffatt, BA (1992). Antifreeze protein produced endogenously in winter rye leaves. Plant Physiol. 100, 593-596. Hatfield, JL, and Prueger, JH (2015). Temperature extremes: effect on plant growth and development. Weather Clim Extrem. 10, 4-10. Hon, WC, Griffith, M, Chong, P, and Yang, DS (1994). Extraction and isolation of antifreeze proteins from winter rye (Secale cereale L.) leaves. Plant Physiol. 104, 971-980. Hurkman, WJ, McCue, KF, Altenbach, SB, Korn, A, Tanaka, CK, and Kothari, KM (2003). Effect of temperature on expression of genes encoding enzymes for starch biosynthesis in developing wheat endosperm. Plant Sci. 164, 873-881. Kapoor, AC, and Heiner, RE (1982). Biochemical changes in developing wheat grains. Changes in nitrogen fractions, amino acids and nutritional quality. J Sci Food Agric. 33, 35-40. Khan, MIR, Nazir, F, Asgher, M, Per, TS, and Khan, NA (2015). Selenium and sulfur influence ethylene formation and alleviate cadmium-induced oxidative stress by improving proline and glutathione production in wheat. J Plant Physiol. 173, 9-18. Kim, DY, Hong, MJ, Park, CS, and Seo, YW (2015). The effects of chronic radiation of gamma ray on protein expression and oxidative stress in Brachypodium distachyon. Int J Radiat Biol. 91, 407-419. Kolmer, JA, Singh, RP, Garvin, DF, Viccars, L, William, HM, and Huerta-Espino, J (2008). Analysis of the Lr34/Yr18 rust resistance region in wheat germplasm. Crop Sci. 48, 1841-1852. Kosová, K, Prášil, I, and Vítámvás, P (2008). The relationship between vernalization-and photoperiodically-regulated genes and the development of frost tolerance in wheat and barley. Biol Plant. 52, 601-615. Kosová, K, Vítámvás, P, and Prášil, IT (2014). Wheat and barley dehydrins under cold, drought, and salinity-what can LEA-II proteins tell us about plant stress response?. Front Plant Sci. 5, 343. Kosová, K, Vítámvás, P, Urban, MO, Prášil, IT, and Renaut, J (2018). Plant Abiotic Stress Proteomics: The Major Factors Determining Alterations in Cellular Proteome. Front Plant Sci. 9, 122. Sampath Kumar, NS, Nazeer, RA, and Jaiganesh, R (2012). Purification and identification of antioxidant peptides from the skin protein hydrolysate of two marine fishes, horse mackerel (Magalaspis cordyla) and croaker (Otolithes ruber). Amino Acids. 42, 1641-1649. Kuwabara, C, Arakawa, K, and Yoshida, S (1999). Abscisic acid-induced secretory proteins in suspension-cultured cells of winter wheat. Plant Cell Physiol. 40, 184-191. Kwak, SS, Kim, SK, Lee, MS, Jung, KH, Park, IH, and Liu, JR (1995). Acidic peroxidases from suspension-cultures of sweet potato. Phytochemistry. 39, 981-984. Lawlor, DW, and Cornic, G (2002). Photosynthetic carbon assimilation and associated metabolism in relation to water deficits in higher plants. Plant Cell Environ. 25, 275-294. Lee, SC, and Luan, S (2012). ABA signal transduction at the crossroad of biotic and abiotic stress responses. Plant Cell Environ. 35, 53-60. Liu, H, Zhang, H, Yang, Y, Li, G, Yang, Y, and Wang, X (2008). Functional analysis reveals pleiotropic effects of rice RING-H2 finger protein gene OsBIRF1 on regulation of growth and defense responses against abiotic and biotic stresses. Plant Mol Biol. 68, 17-30. Liu, Z, Xin, M, Qin, J, Peng, H, Ni, Z, and Yao, Y (2015). Temporal transcriptome profiling reveals expression partitioning of homeologous genes contributing to heat and drought acclimation in wheat (Triticum aestivum L.). BMC Plant Biol. 15, 152. Love, MI, Huber, W, and Anders, S (2014). Moderated estimation of fold change and dispersion for RNA-seq data with DESeq2. Genome Biol. 15, 550. Madoui, MA, Bertrand-Michel, J, Gaulin, E, and Dumas, B (2009). Sterol metabolism in the oomycete Aphanomyces euteiches, a legume root pathogen. New Phytol. 183, 291-300. Maestri, E, Klueva, N, Perrotta, C, Gulli, M, Nguyen, HT, and Marmiroli, N (2002). Molecular genetics of heat tolerance and heat shock proteins in cereals. Plant Mol Biol. 48, 667-681. Meng, L, and Feldman, L (2010). A rapid TRIzol-based two-step method for DNA-free RNA extraction from Arabidopsis siliques and dry seeds. Biotechnol J. 5, 183-186. Mittler, R (2006). Abiotic stress, the field environment and stress combination. Trends Plant Sci. 11, 15-19. Munns, R (2005). Genes and salt tolerance: bringing them together. New Phytol. 167, 645-663. Nakano, Y, and Asada, L (1981). Hydrogen peroxide is scavenged by ascorbate-specific peroxidase in spinach chloroplasts. Plant Cell Physiol. 22, 867-880. Nicolas, ME, Gleadow, RM, and Dalling, MJ (1984). Effects of drought and high temperature on grain growth in wheat. Funct Plant Biol. 11, 553-66. Panchuk, II, Zentgraf, U, and Volkov, RA (2005). Expression of the Apx gene family during leaf senescence of Arabidopsis thaliana. Planta. 222, 926-932. Parker, ML (1985). The relationship between A-type and B-type starch granules in the developing endosperm of wheat. J Cereal Sci. 3, 271-278. Pearce, S, Huttly, AK, Prosser, IM, Li, YD, Vaughan, SP, and Gallova, B (2015). 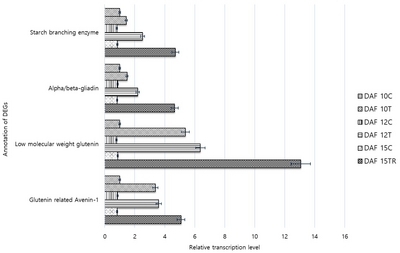 Heterologous expression and transcript analysis of gibberellin biosynthetic genes of grasses reveals novel functionality in the GA3ox family. BMC Plant Biol. 15, 130. Shewry, PR (2009). Wheat. J Exp Bot. 60, 1537-1553. Shewry, PR, and Kreis, M (1987). Biotechnology and improvement of feeds. Proc Nutr Soc. 46, 379-385. Slominski, BA, and Campbell, LD (1990). Non-starch polysaccharides of canola meal: Quantification, digestibility in poultry and potential benefit of dietary enzyme supplementation. J Sci Food Agric. 53, 175-184. Stintzi, A, Heitz, T, Prasad, V, Wiedemann-Merdinoglu, S, Kauffmann, S, and Geoffroy, P (1993). Plant ‘pathogenesis-related’ proteins and their role in defense against pathogens. Biochimie. 75, 687-706. Stone, PJ, and Nicolas, ME (1994). Wheat cultivars vary widely in their responses of grain yield and quality to short periods of post-anthesis heat stress. Funct Plant Biol. 21, 887-900. Stone, PJ, and Nicolas, ME (1995). A survey of the effects of high temperature during grain filling on yield and quality of 75 wheat cultivars. Aust J Agric Res. 46, 475-492. Sun, XL, Yu, QY, Tang, LL, Ji, W, Bai, X, and Cai, H (2013). GsSRK, a G-type lectin S-receptor-like serine/threonine protein kinase, is a positive regulator of plant tolerance to salt stress. J Plant Physiol. 170, 505-515. Tedeschi, F, Di Maro, A, Facchiano, A, Costantini, S, Chambery, A, and Bruni, N (2012). Wheat Subtilisin/Chymotrypsin Inhibitor (WSCI) as a scaffold for novel serine protease inhibitors with a given specificity. Mol Biosyst. 8, 3335-3343. Thomashow, MF (1999). Plant cold acclimation: freezing tolerance genes and regulatory mechanisms. Annu Rev Plant Physiol Plant Mol Biol. 50, 571-599. Uldry, M, and Thorens, B (2004). The SLC2 family of facilitated hexose and polyol transporters. Pflugers Arch. 447, 480-489. Van Loon, LC, Pierpoint, WS, Boller, T, and Conejero, V (1994). Recommendations for naming plant pathogenesis-related proteins. Plant Mol Biol Rep. 12, 245-264. Vranová, E, Inzé, D, and Van Breusegem, F (2002). Signal transduction during oxidative stress. J Exp Bot. 53, 1227-1236. Wright, SF, and Anderson, RL (2000). Aggregate stability and glomalin in alternative crop rotations for the central Great Plains. Biol Fertil Soils. 31, 249-253. Zhang, WJ, Pedersen, C, Kwaaitaal, M, Gregersen, PL, Mørch, SM, and Hanisch, S (2012). Interaction of barley powdery mildew effector candidate CSEP0055 with the defence protein PR17c. Mol Plant Pathol. 13, 1110-1119.